The need for new reporting guidance was identified by a survey of medical editors. A list of possible items based on a systematic review was created. A two round, modified Delphi panel consisting of representatives from academia, clinical practice, industry, government, and the editorial community was conducted. Out of 44 candidate items, 24 items and accompanying recommendations were developed. The recommendations are contained in a user friendly, 24 item checklist. A copy of the statement, accompanying checklist, and this report can be found on the ISPOR Health Economic Evaluations Publication Guidelines Task Force website (http://www.ispor.org/TaskForces/EconomicPubGuidelines.asp). Health economic evaluations are conducted to inform resource allocation decisions. Economic evaluation has been defined as “the comparative analysis of alternative courses of action in terms of both their costs and their consequences” . 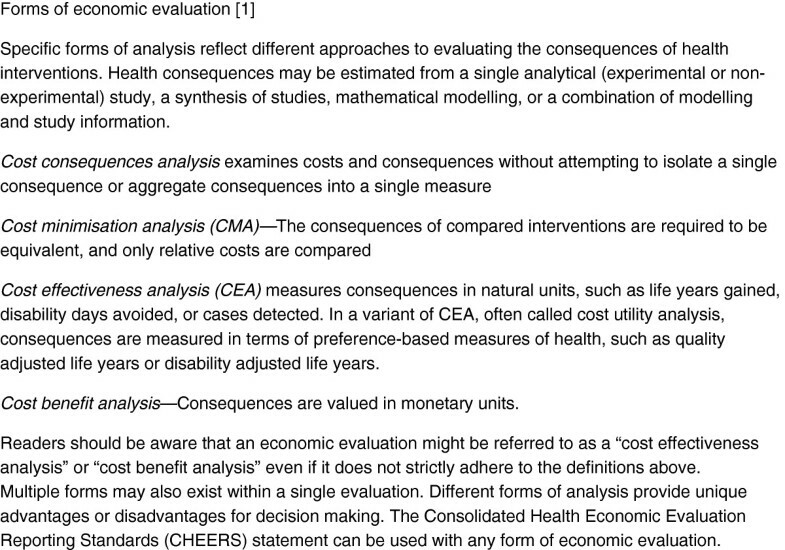 All economic evaluations assess costs, but approaches to measuring and valuing the consequences of health interventions may differ (see Figure 1). Economic evaluations have been widely applied in health policy, including the assessment of prevention programmes (such as vaccination, screening, and health promotion), diagnostics, treatment interventions (such as drugs and surgical procedures), organisation of care, and rehabilitation. Economic evaluations are increasingly being used for decision making and are an important component of programmes for health technology assessment internationally . Compared with clinical studies, which report the consequences of an intervention only, economic evaluations require more reporting space for additional items, such as resource use, costs, preference related information, and cost effectiveness results. This creates challenges for editors, reviewers, and those who wish to scrutinise a study’s findings . There is evidence that the quality of reporting of economic evaluations varies widely and could potentially benefit from improved quality assurance mechanisms [4, 5]. Even if measures to promote transparency exist, such as registries, biomedical journal editors have increasingly promoted and endorsed the use of reporting guidelines. Endorsement of guidelines by journals for randomised controlled trials has been shown to improve reporting . The combination of the risk of making costly decisions due to poor reporting with the lack of mechanisms that promote accountability makes transparency in reporting economic evaluations especially important and a primary concern among journal editors and decision makers [3, 7]. The aim of the Consolidated Health Economic Evaluation Reporting Standards (CHEERS) statement is to provide recommendations, in the form of a checklist, to optimise reporting of health economic evaluations. The need for a contemporary reporting guidance for economic evaluations was recently identified by researchers and biomedical journal editors . The CHEERS statement attempts to consolidate and update previous efforts [9–20] into a single useful reporting guidance. The primary audiences for the CHEERS statement are researchers reporting economic evaluations and the editors and peer reviewers evaluating their publication potential. We hope the statement (which consists of a 24 item checklist and accompanying recommendations on the minimum amount of information to be included when reporting economic evaluations) is a useful and practical tool for these audiences and will improve reporting and, in turn, health and healthcare decisions. To best understand and apply the recommendations contained within the statement, we encourage readers to access the Explanation and Elaboration Report . The CHEERS Task Force followed current recommendations for developing reporting guidelines . Briefly, the need for new guidance was first identified through a survey of members of the World Association of Medical Editors. Of the 6% (55/965) who responded, 91% (n = 50) indicated they would use a standard if one were widely available . Next, published checklists or guidance documents related to reporting economic evaluations were identified from a systematic review and survey of task force members . Both of these activities were used to create a preliminary list of items to include when reporting economic evaluations. Recommendations of the minimum set of reporting items were then developed through a modified Delphi panel process. Forty eight individuals identified by the task force with broad geographical representation and representing academia, biomedical journal editors, the pharmaceutical industry, government decision makers, and those in clinical practice were invited to participate. Thirty seven agreed to participate. Participants were asked to score importance on a Likert scale and the average scores, weighted by each individual’s confidence in ability to score, were then used to rank items. A cut-off point was applied to the ranked list to determine the minimum number of items important for reporting. The CHEERS statement recommendations have been independently reviewed and subsequently revised by task force members. The recommendations are entirely those of the task force—the sponsors of the study had no role in study design, data analysis, data interpretation, or writing of the final recommendations. A more complete description of the methods and findings of the Delphi panel are found in the larger explanation and elaboration document . The final recommendations are subdivided into six main categories: (1) title and abstract; (2) introduction; (3) methods; (4) results; (5) discussion; and (6) other. The recommendations are contained in a user friendly, 24 item checklist (Table 1) to aid users who wish to follow them. A copy of the checklist can also be found on the CHEERS Task Force website. (http://www.ispor.org/TaskForces/EconomicPubGuidelines.asp). In order to encourage dissemination and use of a single international standard for reporting, the task force approached 14 journals identified as either the largest publishers of economic evaluations or widely read by the medical and research community. Thirteen journals responded, and 10 expressed their ability and interest in endorsing this guidance. The CHEERS statement is being simultaneously published in BMC Medicine, BMJ, BJOG: An International Journal of Obstetrics and Gynaecology, Clinical Therapeutics, Cost Effectiveness and Resource Allocation, The European Journal of Health Economics, International Journal of Technology Assessment in Health Care, Journal of Medical Economics, Pharmacoeconomics, and Value in Health. To facilitate wider dissemination and uptake of this reporting guidance, we encourage other journals and groups to consider endorsing CHEERS. 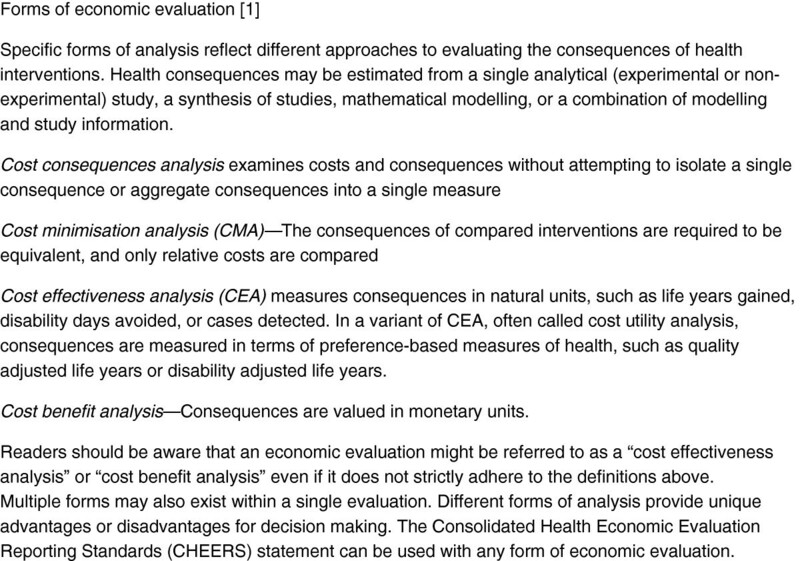 Identify the study as an economic evaluation or use more specific terms such as “cost-effectiveness analysis”, and describe the interventions compared. Provide an explicit statement of the broader context for the study. Present the study question and its relevance for health policy or practice decisions. Synthesis-based estimates: Describe fully the methods used for identification of included studies and synthesis of clinical effectiveness data. Describe and give reasons for the specific type of decision-analytical model used. Providing a figure to show model structure is strongly recommended. If applicable, report differences in costs, outcomes, or cost-effectiveness that can be explained by variations between subgroups of patients with different baseline characteristics or other observed variability in effects that are not reducible by more information. Describe any potential for conflict of interest of study contributors in accordance with journal policy. In the absence of a journal policy, we recommend authors comply with International Committee of Medical Journal Editors recommendations. For consistency, the CHEERS statement checklist format is based on the format of the CONSORT statement checklist. We believe the CHEERS statement represents a considerable expansion over previous efforts. The strength of our approach is that it was developed in accordance with current recommendations for the development of reporting guidelines, using an international and multidisciplinary team of editors and content experts in economic evaluation and reporting . Similar to the approach taken with other widely accepted guidelines, we have defined a minimum set of criteria though a modified Delphi technique and have translated these into recommendations, an explanatory document with explanations, and a checklist. Unlike some previous reporting guidance for economic evaluation, we have also made every effort to be neutral about the conduct of economic evaluation, allowing analysts the freedom to choose different methods. There may be several limitations to our approach. A larger Delphi panel with a different composition could have led to a different final set of recommendations . Some less common approaches and contexts (such as public health, developing countries, and system dynamic models) for conducting health economic evaluation may not be well represented by our sample of experts. Additionally, like many Delphi panel processes, we based decisions to reject or accept criteria on arbitrary levels of importance. However, we feel the group recruited to create the statement is sufficiently knowledgeable of the more common applications of economic evaluation, and the rules used to select criteria were created a priori and are consistent with previous efforts. All CHEERS Task Force members are volunteers. Support for this initiative was provided by the International Society for Pharmacoeconomics and Outcomes Research. This article is a joint publication by BMC Medicine, Cost Effectiveness and Resource Allocation, BJOG: An International Journal of Obstetrics and Gynaecology, BMJ, Clinical Therapeutics, The European Journal of Health Economics, International Journal of Technology Assessment in Health Care, Journal of Medical Economics, Pharmacoeconomics and Value in Health. Each publisher holds its own copyright. All authors have completed the ICMJE uniform disclosure form at http://www.icmje.org/coi_disclosure.pdf and declare: FA served as board member for the study funder; FA, AHB, CC, MD, DG, DH, EL, JM, and SP were provided support for travel to a face-to-face meeting to discuss the contents of the report; FA and MD have received payment from the study sponsor for serving as co-editors for Value in Health; no other relationships or activities that could appear to have influenced the submitted work. Elizabeth Loder is BMJ clinical epidemiology editor. She played no part in the peer review or decision making of this paper at the editorial level, and contributed solely as an author. All authors provided a substantial contribution to the design and interpretation of the protocol and guidance, as well as writing sections of drafts, revising based on comments received, and approving the final version. DH conducted the analysis of Delphi panel responses, drafted and revised the protocol and the drafts of this paper, and is the guarantor for the study. All authors read and approved the final manuscript.